1. Sprinkle gelatin over the water and let sit. 2. In a medium bowl beat together the cheese and 1/2 cup of the sugar. 3. In a double broiler over barely simmering water, whisk the egg yolks and remaining 1/2 cup of sugar together until pale in color, about 3-4 minutes. 4. Cook the mixture until it thickens and coats the back of a spoon. Stir in gelatin off the heat and whisk gently until completely dissolved. 5. Stir in the Passion Fruit and mix the egg mixture into the cheese mixture, scraping down the sides of the bowl occasionally. 6. In a medium bowl, whip the cream until it forms soft peaks, do not over mix. 7. Gently fold the whipped cream into the cheese egg mixture. Pour into molds, level the top, refrigerate until chilled and firm. 1. 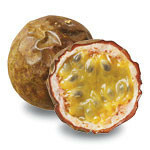 In a small pan, mix the Passion Fruit and water. 2. Sprinkle the gelatin over the liquids. Let mixture sit for a minute. 3. Warm mixture over low heat, do not boil. When gelatin is melted take off heat. 4. Pour into a medium bowl and pur into a cold water bath. When mixture thickens pour over top of cake.